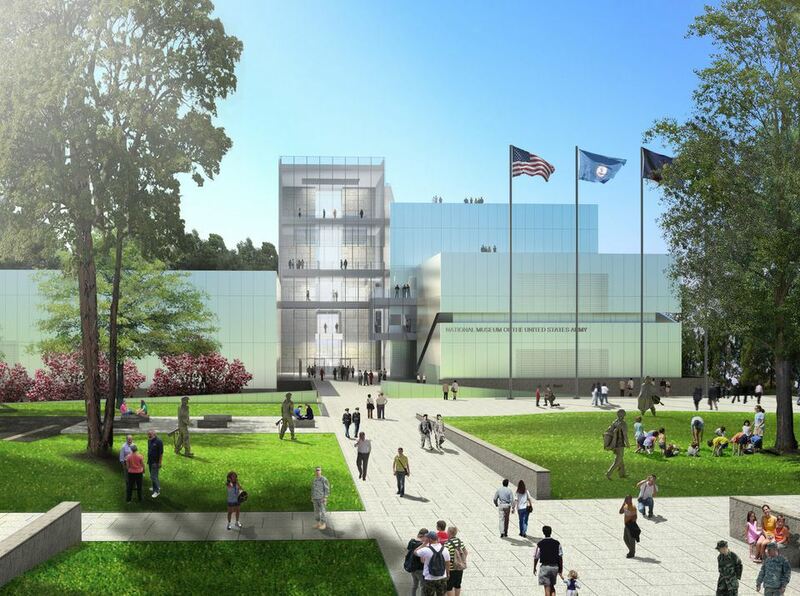 The U.S. Army Museum, officially named The National Museum of the United States Army, will be constructed at Fort Belvoir, Virginia to honor the service and sacrifice of all American Soldiers who have served since the Army’s inception in 1775. It will be a state-of-the-art facility that will preserve the history of America’s oldest military service and educate visitors about the Army’s role in the nation’s development. The museum will be built just 16 miles south of Washington, DC. The groundbreaking was held in September 2016 and the museum is expected to open in 2018. The main building of the U.S. Army Museum will be approximately 175,000 square feet and will be set on 41 acres of land. It will be built on a portion of the Fort Belvoir Golf Course which will be reconfigured in order to retain 36 holes of golf. A memorial garden and park will be included to accommodate reenactments, educational programs, and special events. The architectural firm of Skidmore, Owings & Merrill has been selected to design the museum, while Christopher Chadbourne & Associates will oversee the planning and design of the galleries and exhibits. The Army Historical Foundation is raising money for construction of the museum from private donors. An expected $200 million dollars is needed. Soldiers’ Stories Gallery – This gallery will feature personal accounts from soldiers serving from all generations, offering a glimpse into their personalities, emotions, and values at their time of service. Fighting for the Nation Gallery – The exhibit will highlight the stories of triumph and sacrifice from the first shots of the Revolutionary War to the difficult years of the Civil War, to the overseas service of the last century and today’s ongoing Global War on Terrorism. Army and Society Gallery – The gallery will examine the interactions between the Army and U.S. citizens, including humanitarian efforts, the increasing diversity of the military and the efforts of the American people to show their soldiers support. The Army Theatre – The state-of-the-art theatre in the round will seat 125 visitors and will be used for a variety of special events, presentations, lectures, and ceremonies. North Post of Fort Belvoir, VA, less than 30 minutes south of our nation’s capital in Washington, DC. Directions: From Washington DC, travel south on I-95, take the Fairfax Parkway/Backlick Road (7100) exit 166 A. Take the Fairfax County Parkway to its end at U.S. Rt. 1 (Richmond Highway.) Turn left. At the first light, on the right, is the entrance for Tulley Gate on to Fort Belvoir. Fort Belvoir is located in Fairfax County, Virginia near Mount Vernon. It is one of the nation’s most prominent defense installations, home to Army major command headquarters, units and agencies of nine different Army major commands, 16 different agencies of the Department of the Army, eight elements of the U.S. Army Reserve and Army National Guard and nine DoD agencies. Also located here are a U.S. Navy construction battalion, a Marine Corps detachment, one U.S. Air Force unit and an agency of the Department of Treasury. For more information, visit www.belvoir.army.mil. The Army Historical Foundation was established to assists and promotes programs which preserve the history of the American Soldier and promote public understanding of and appreciation for the contributions by all components of the U.S. Army and its members. The Foundation serves as the Army’s official fundraising entity for the National Museum of the United States Army.